VILLAS AND APARTMENTS TO RENT IN SIERRA NEVADA, SPAIN. 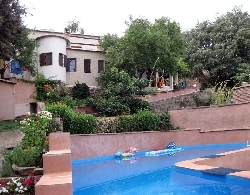 Welcome to our selection of holiday homes to rent in Sierra Nevada, Spain. Sierra Nevada is Europes southern most mountain range and is well known for its ski resort, just 20 minutes from Granada. Sierra Nevada allows visitors to ski in the morning, and sunbathe in the afternoon. Sierra Nevada also offers over 86,000 hectares of national parkland to enjoy, visitors are offered a range of activities including hiking, cycling and paragliding allowing them to see the beautiful landscape and wildlife. Looking for self catering holiday accommodation in Sierra Nevada? Then below is a selection of holiday apartments in Sierra Nevada and holiday villas in Sierra Nevada that can be rented direct from their owners. You can either click on each listing for further details or you can use our search engine on the left if you are looking for something in particular. Solynieve (skiing) - There are a range of winter sports to be had at the Solynieve. A wide choice of runways allows for visitors of all ages and skiing levels to have a good day out. Other winter sport activities available are; Snowboarding, cross country skiing and skating. Apart from winter sports, other activities that are popular include; hiking, rock climbing and birdwatching. Villages of the Alpujarras - The villages of the Alpujarras are situated between the Sierra Nevada and the sea. The Alpujarras has a range of beautiful villages with some stunning countryside. With some of the best trails in the country, if you enjoy hiking visiting the Villages of the Alpujarras is a must. Balneario de Lanjar�n - The Balneario de Lanjar�n is a natural spa located in Lanjar�n, which is one of the villages of Alpujarras. Surrounded by the Sierra Nevada, the natural spa offers a peaceful atmosphere in which you can fully relax and get away from it all. The spa's natural medicinal qualities have been renowned since 1765. Granada Airport is 48 kilometres from Sierra Nevada and is the nearest airport. Pablo Picasso Airport (Malaga) is a 90-minute car drive to Sierra. Sierra Nevada stands for snowy range in the Spanish language. It is a rugged mountain range, the highest in Europe after the Alps. In 1998, it was declared a national park, the second in the region of Andalucia. The mountain range contains more then 20 peaks with a height higher then 3000m. On the west side of the park is Solynieve, a skiing resort, which is usually open between the months of November and April.